I know I keep saying this but where oh where does the time go?! I am just blown away at how fast time goes by! Cole is almost 10 months already!!! Ahhhh Slow down time!! 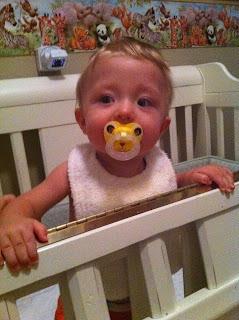 He is starting to try to get up to a stand in his crib, etc.. He LOVES to hold on to our hands and walk around. He also uses us as a human jungle gym. LOL We just love him more and more everyday!! !